ISLAMABAD, 13 October 2017: Haroon Khan, a journalist associated with Mashriq TV and a publication Akhbar Khyber, was shot dead in front of his home in Swabi, Khyber Pakhtunkhwa on Thursday, 12 October 2017. 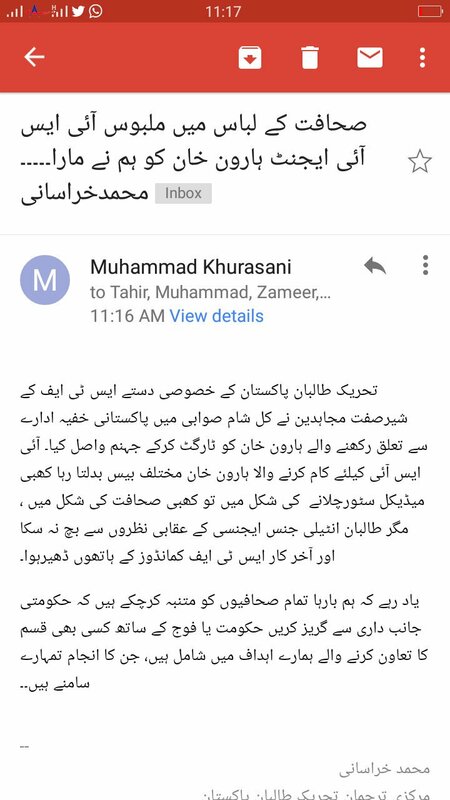 An email allegedly circulated by Muhammad Khursani, spokesperson of Tehreek e Taliban Pakistan claims responsibility for the attack. The email calls the slain journalist ‘an undercover intelligence agent’ and reiterates its warning to the journalist community to refrain from having any linkages with the Pakistan Government or Army. Speaking to Media Matters for Democracy, the President Khyber Union of Journalists, Saiful Islam Saifee said that Haroon Khan was a very active journalist reporting from Swabi. He says that in his last meeting with the slain journalist, Haroon Khan mentioned that he has a big story and ‘some people’ are not happy with him. Details about this story were not shared. According to media reports, District Police Officer, Muhammad Shoaib expressed the suspicion that the killing was a linked to a personal land-related dispute with his step-brothers. However, journalist unions and associations in Swabi and Khyber Pakhtunkhwa remain concerned that the police is simply opting for the easiest route of the investigation. “There was some enmity between Haroon Khan and his stepbrothers, but the way the journalist has been targeted is very alarming. He was shot dead right in front of his home by two unknown assailants on a motorbike” says Saiful Islam Saifee, President KhUJ, “It is very unlikely that the journalist’s stepbrothers would have him killed in front of his home”. Saifee believes that the police is investigating personal enmity simply because it is most convenient for them. The fears of journalist unions about possibly misdirected investigations are rooted in the rate of impunity in cases of killings of journalists. Despite being counted among one of the most dangerous countries in the world for journalists, the government has failed in lowering the impunity rates – there have been convictions in less than 5% of the cases of journalist killings during the last 17 years. Pakistan has been a pilot country for the implementation of the UN Action Plan on Safety of Journalists and Issue of Impunity since 2014. However, despite multiple commitments and obligations the situation within the country has not changed. In 2015, following murders on consecutive days, MMfD sent a petition to (then) Prime Minister, Mian Nawaz Sharif, demanding an end to the culture of impunity and expedition of investigations in cases of attacks on journalists. Multiple meetings with representatives of Ministry of Information and Broadcasting were also held on the issue, leading to various commitments. However, the government has yet to translate into action what it commits verbally. Key legislation for journalist safety, that specifically deals with making the ‘investigations and prosecutions of the crimes against media independent’ has been a key demand of Media Matters for Democracy. At the end of 2016, the information ministry began a round of consultations on a proposed Journalist Welfare and Safety Bill but with an extraordinary focus on the ‘welfare’ part. Media Matters for Democracy at the event presented a model safety law drafted by an advocate Yasser Hamdani and an advocate/legal advisor Kamran Arif. The current Information Minister, Maryam Aurangzaib, also held a dialogue with the journalist community in National Press Club on the same legislation where members from Media Matters for Democracy participated and shared concerns on the current approach of this legislation. The draft of ‘Journalist Welfare and Safety Bill’ does not cover the issue of investigations or of tackling impunity and remains focused on welfare elements and monitory support to families of slain journalists. “A law that does not deal with the issue of impunity will not add anything to the efforts of keeping journalists safe” says Asad Baig, Executive Director, Media Matters for Democracy, “The attacks on the journalists have continued and escalated for the past 17 years because the attackers know that there would be no consequences for these murders. The draft government is proposing fails to address the cause of the issue and what it offers are just after-the-fact cosmetic measures”.